The original 1950s basement looked its age: dark and unfinished, with exposed joists, ducts, and wires. Doing the laundry was a particularly challenging chore in such a dysfunctional space. Adding a new bathroom provided the perfect L-shaped new cheerful laundry area with white storage cabinets. The undermount laundry sink shared a wall with one of the couple’s new shower fittings. 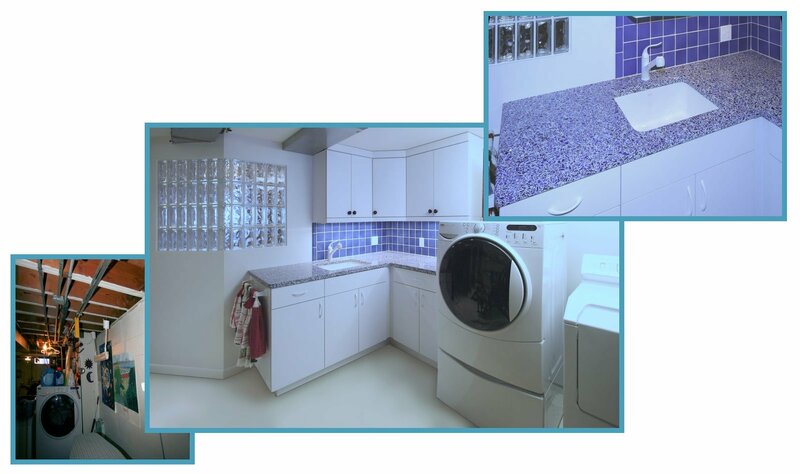 After the remodeling, doing the laundry is enjoyable, in the well-lit new room with blue glass “Vetrazzo” countertops and blue tile backsplashes.